Studies have shown that a healthy cardiovascular system has a positive effect on hearing. A higher level of physical activity is associated with a lower risk of hearing loss in women as determined by a recent study out of Brigham and Women’s Hospital. In contrast, impaired cardiovascular health negatively impacts hearing since the inner ear is very sensitive to reduced blood flow and blood vessel trauma. A low frequency hearing loss may, in fact, be an early warning sign of cardiovascular disease. Adults with Type 2 diabetes have twice the risk factor for developing hearing loss due to the damage caused by the disease to the inner ear. This correlation highlights the need for regular hearing checks. The earlier a hearing loss is diagnosed, the more effective hearing treatment options are likely to be. Hearing loss is also related to an increased risk of falling if left untreated. People who do not hear well may lack good awareness of their overall environment, thus increasing the potential to trip and fall. Reduced sensory input also increases the cognitive demands on the person who is trying to maintain balance and gait. In addition, hearing disorders may include vestibular dysfunction leading to poor balance. Multiple studies have indicated that untreated hearing loss can affect cognitive brain function and is associated with early onset of dementia in older people. A 2011 study at the University of Pennsylvania concluded that a decline “in hearing abilities may accelerate gray matter atrophy and increase the listening effort necessary to comprehend speech.” Could improved hearing then decrease the chance of developing dementia? The conclusion of the study was that “Hearing aids may not only improve hearing but preserve the brain.” Several recent studies have concluded that early diagnosis and treatment of hearing loss slows the progression of dementia and Alzheimer’s disease. Certain chemotherapy medications or radiation therapy can cause damage to the ears and therefore result in temporary or permanent hearing loss, tinnitus and/or balance disorders. This is something that patient and physician should discuss so that the patient can be aware of the potential risks. A hearing-monitoring program could then be put into place as part of the treatment process and thus relieve potential anxiety and prompt timely treatment. Hearing and good health go together. If someone suspects hearing loss, an audiological evaluation can help the physician determine other health conditions. Prompt treatment of hearing loss can also help prevent other undesirable complications; such as falling, dementia and depression. 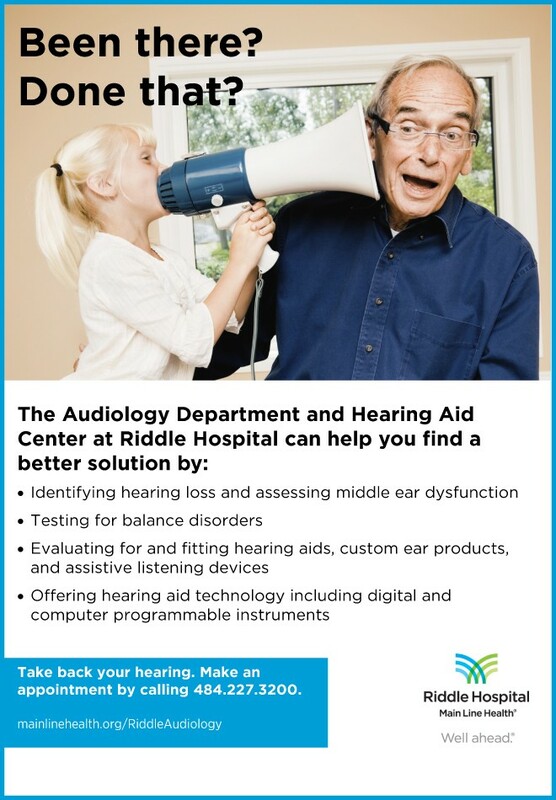 The audiologists at Riddle Hospital are a team of caring professionals who are ready to evaluate and advise you regarding your need for further medical evaluation and hearing treatment. We use best practices to advise you of your options for hearing, tinnitus and balance disorders. Our services include comprehensive audiological evaluation, middle ear studies, tinnitus evaluation and treatment, vestibular testing, and complete hearing aid services, which include a thorough listening needs assessment and live hearing aid demonstration. Once medical clearance is given, all treatment plans are tailored to the individual’s specific needs. ← Previous Story Physical Therapist Or A Chiropractor?